Maruti Suzuki deserves a big round of applause for offering six automatic variants in the new Dzire. The AMT tech not just offers gearless convenience but also doesn’t compromise fuel economy, and of course, keeps the sticker price in check too! With multiple automatic variants on offer, the Dzire AMT will be accessible to a wider set of buyers.The second-gen Swift Dzire too was equipped with an AMT paired with the diesel engine. Both the engine & the gearbox are carried forward in the new Dzire but are calibrated differently. This results in smoother gearshifts. So, while the AMT still takes its own good time to upshift or downshift, the cabin experience is slightly richer than before as the head nod that accompanied every gear change previously is now subdued, but it’s still there. The 1.3-litre diesel engine makes 75PS of max power at 4000rpm & 190Nm of peak torque at 2000rpm. The continuous torque surge makes the diesel Dzire a great mile muncher with very less downshifts required to make quick progress. When out on the highways, it’s best to use AMT in the semi-manual mode for downshifting to time the overtakes better, and also to hold upshifts and utilise the power band to spring back to three-digit speeds. In normal driving conditions the AMT is keen to upshift early. The artificial intelligence prompts the ‘box to upshift below 3000rpm on medium throttle input.It does, however, hit the redline before upshifting with the A-pedal completely depressed. The AMT’s party trick is the creep function which allows you to pull the car forward from nought in the second gear. It’s like moving in traffic on half a clutch. Try doing that on the manual Dzire to realise the importance of an automatic. So, while the diesel manual Dzire should continue to munch miles, the AMT-diesel is now better suited for frequent city spins. But the powertrain of the moment should go to the petrol-AMT combination. The 1.2-litre (83PS, 113Nm) petrol engine is a refined unit, and it was there on-duty in the Swift Dzire as well. The engine is the same, but it comes with the 5-speed AMT now instead of the 4-speed torque converter (and there’s a 5-speed manual as well). The drive experience of the petrol-AMT combination is plush thanks to low NVH levels and smooth gear shifts. The gear shift quality may not be as silky as in the Ignis petrol-AMT (same engine-transmission combo), but it won’t give you a dramatic head-nod moment you’d associate with AMTs in general. Steering weight is well judged and consistent while braking performance is up to the job. We did find that the AMT-equipped cars offered better braking feel. Standard ABS is a feature that we’re thrilled to see, one that hopefully will negate the need for deployment of the standard dual airbags. With the Dzire nailing its role of being the comfy, yet fun family car, we can’t wait to see what’s in store with the upcoming Swift, a car that should be on the naughtier side of things! 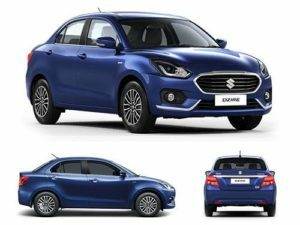 The new generation Dzire looks like it is making amends. It’s also the first Dzire that wants to break free from the Swift tag. By offering six automatic variants the Dzire makes itself a lot more desirable now. Safety features like ABS & dual front airbags too are now standard across the range. So, does the new Dzire have it in it to better its predecessors on practicality and score high on both form and function? Let’s find out.